On the occasion of the official announcement of J.R.R. Tolkien’s memorial project, Tolkiendrim’s team had the opportunity to get an exclusive interview with Tim Tolkien. We asked him many questions regarding his relationship with his great uncle, his work and about the memorial project. Many thanks to Piotr Galeziak and William Badger for their precious help to organize this interview. Hope you will be as thrilled as we were. Enjoy ! Tolkiendrim : Have you ever met your great-uncle ? And if you did, which memories do you keep from him ? Tim Tolkien : I was 11 years old in 1973 when my Great Uncle died so I had many opportunities to meet with him, even from an early age. Somewhere I have my first birthday card, signed Great Uncle Ronald and Great Aunt Edith, as a treasured gift. Ronald was of course my Grandfather Hilary’s elder brother, and as Hilary didn’t drive there were occasions when we would all travel down by car together to see Ronald end Edith when they lived on the south coast, or more commonly we would meet up at Blackminster, Near Evesham, about an hour south of Birmingham, which was my Grandfather’s home and where my father and his 2 brothers grew up. It was a small holding of just under 5 acres, mostly orchards of apples, plums and pears and the local delicacy of Asparagus. It was the significant anniversaries in the late 1960’s / early 1970’s, towards the end of Ronald’s and Hilary’s lives that I remember most clearly.By that time he was just starting to get the worldwide recognition for his writing, although this meant nothing to me, my brothers and cousins. The adults of the company might have been slightly vying for his company but he always managed to position himself (by accident or design I don’t know) at the edge of the main (grown-ups) table and adjacent to ours and would then spend much of the meal leaning over to talk and joke with us! To us he was an interesting and affable old man who took more than a passing interest in our conversations. Tolkiendrim : Could you try to describe him in three words ? Tolkiendrim : We assume that you know well his stories, which one do you prefer and why ? Tim Tolkien : It is reasonably well known in certain circles, and always causes much disbelief, that I have never really read my Great Uncle’s books. I never make the time nor find the process of reading for pleasure enjoyable. If someone reads to me, that is a different matter all together. The Hobbit was on the school reading list when I was about 12 and I DID manage that, and I dipped into the lighter (thinner) volumes such as Farmer Giles of Ham, but I have never managed LOTR, Silmarillion or any other associated texts. This is not a comment on him as a writer, but on myself as a reader: he wrote, but I don’t read ! Tolkiendrim : Who is your favourite character in this secondary world, and why ? 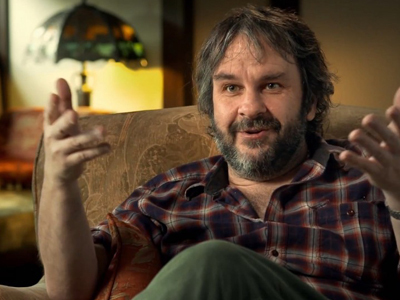 Tim Tolkien : I couldn’t say I know the main characters well enough to have favourites. Of course I have seen the LOTR films but then you have the input and interpretation of other creative people. There are certain ‘characteristics’ that are both universal and familial: certainly at various times members of the family may have been likened themselves or each other to specific characters. But, of course, I would be disloyal to explain who thought who was like whom ! I suppose my favourites would be from the secondary order; I hold an interest and affection for the Ents naturally, (I have researched them, read about them and tried to gage their character to influence my designs for the Moseley Ent sculpture). Treebeard belongs to that old natural order, strongly backed up by what I have gleaned from my Great uncle’s and my Grandfather’s lives and especially that changing of society from pastoral to industrial at the end of the 19th centuary. I have also always loved Dragons, large or small, good or bad: and I believe in all Dragons. I painted four huge dragons on my bedroom ceiling as a boy. My room was in the roof so had sloped ceilings. I shared it with my brother Nic. Mum had sort of said I could but I didn’t really know if Ibelieved her, so one morning waited until she went out for a long walk with the dogs before quickly painting the outlines of the first, a purple and green dragon with flaming nostrils, diving headfirst into the room, so when she came back it would be too late! It was, of course, fine and so I finished the first and painted the other 3 over the following weeks. Because of this I would also have to include Smaug. If I had to choose from the main order, I guess I would say Gandalf. If we, the Tolkien family, are the Hobbits, then we need a helping hand from time to time, like a guardian angel at times of need ! Tolkiendrim : What brought you to work in the artistic world ? Tim Tolkien : I’m sure my natural inclination towards the arts is both nature and nurture. Both my parents were artistic in their own way; they met at the BBC in London where my father was a sound engineer and my mother was a make up artist, after a career as a window dresser/ designer, and my father was a keen amateur painter and photographer. I was never short of encouragement to draw and make things and there was always scrap paper (scripts from shows at the BBC) around to use for as much drawing as one wanted. I used to love building things from cardboard and other found objects too, anything from cereal packet suits of armour to .model cars for my toys to paper chess sets. But I never counted this as art. Art was painting and drawing, which I did a huge amount of throughout my early life; I would draw anything and everything and at Grammar school I had a good little business selling paintings of steam railway locomotives to the masters ! I naturally progressed through the school system and on to university to study Fine Art for my degree. It was only there, frustrated by the lack of rapport with my painting tutor, that I changed to sculpture, utilising all my self taught practical modelling skills, and I haven’t looked back since ! The last pieces I produced for my degree show were in metal; welded steel, beaten aluminium, cast lead and bronze and joined with bolts and rivets or even wired with copper electrical cable. When I came out into the ‘real world’ the need to produce solid permanent artworks lead me to choose this as my main medium, focussing on welded steel. Tolkiendrim : Why did you choose sculpture over an other kind of art ? Tim Tolkien : I was lucky enough to get ‘picked up’ by a Gallery fresh out of Art school, so as I finished I moved myself and a selection of my degree show sculptures down to Canterbury for display at the Victorian mansion home and gallery of Nicholas Treadwell. He also gave me use of a studio in return for helping out with the running of the gallery, driving the van etc. and I started producing sculptures in riveted metals, found objects and occasionally stone or wood, all for sale at the main international Art Fairs. Although I seldom sell my sculpture through the gallery these days, everything is now commissioned in advance, Nick, currently based in Linz, Austria, remains a good friend. In the early 1990’s I started to branch out into commissioned public art rather than speculative artworks for sale through a gallery. Although I had sold most of what I produced whilst at the gallery, the price you can achieve as a young artist especially producing bespoke ‘one off’ pieces, is not enough to bring in a living wage. Public Art has a very different job to do than that of gallery pieces. They need to be acceptable to the wider community, often designed through public consultation, and they need to have a sense of place- ie ‘belong’ in some way to the space they occupy and the community that uses othat place, be it a school, a main round-about or a public open space. I have often been asked to produce artworks that recognise or commemorate iconic people or significant occasions. This is always a special duty and a privilege. 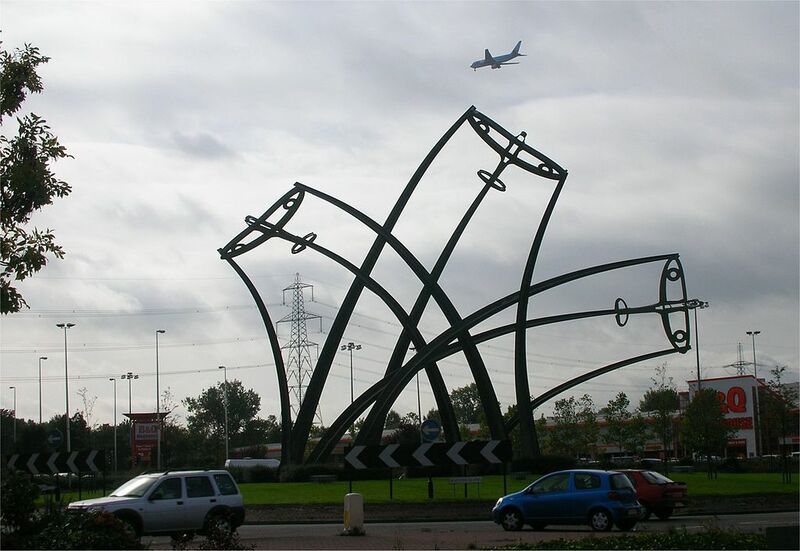 ‘Sentinel ‘, the Spitfire sculpture, depicting 3 half scale silhouette planes on girder vapour trails, which still remains the largest piece of public art in the Midlands region and recognising that 11,000 of these iconic fighters were built in the adjacent factory during WW2, and a statue of the blessed John Henry Cardinal Newman, which was blessed by his Holiness Pope Benedict during his visit to Birmingham in 2010.., to name but a few. The Tolkien memorial for Pembroke college will continue this line. Tolkiendrim : You mainly use metal in your creations, why this material ? Tim Tolkien : Public sculpture demands :- Robust, durable, vandal resistant and cost effective and this usually equates to welded steel. This is then made more long lasting by dipping in molten zinc, a process known as galvanising, and it is this material that most of my artworks have been made of for the past couple of decades. I have also incorporated glass mosaic tiles or cast aluminium and gun metal elements when required. This element is particularly valuable when there is a desire for direct community involvement within the final piece as the original art features can be moulded in clay, wax or plaster using simple tools or fingers. 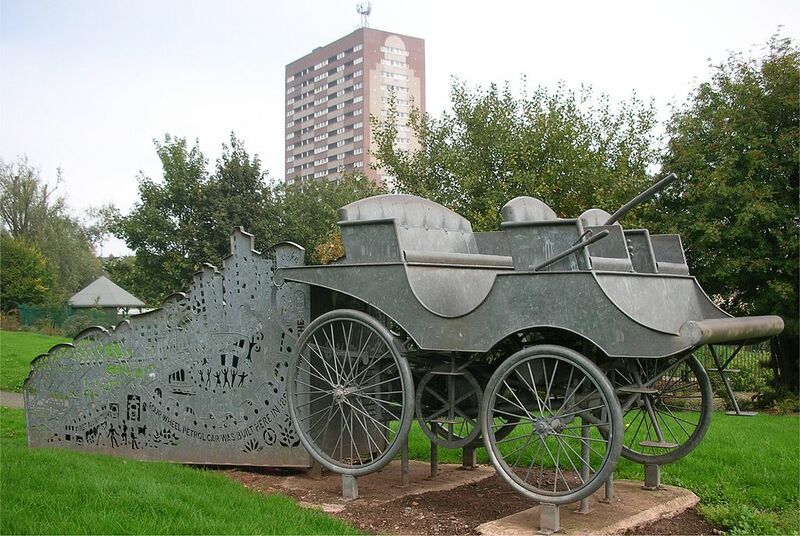 Sometimes the galvanised metal is spray coated in a different metal to imitate, say, bronze, or painted, again where the particular project requires. The frame on the Tolkien memorial will be fabricated this way, in mild steel but bronze coated to match the central bust. Tolkiendrim : What’s the last sculpture you’ve made ? Tim Tolkien : Strangely in the last two or three pieces I have been able to allow the steel to rust naturally. I love the warm colour of rusting steel. Last Autumn I produced a piece to mark the anniversary of the Great War. 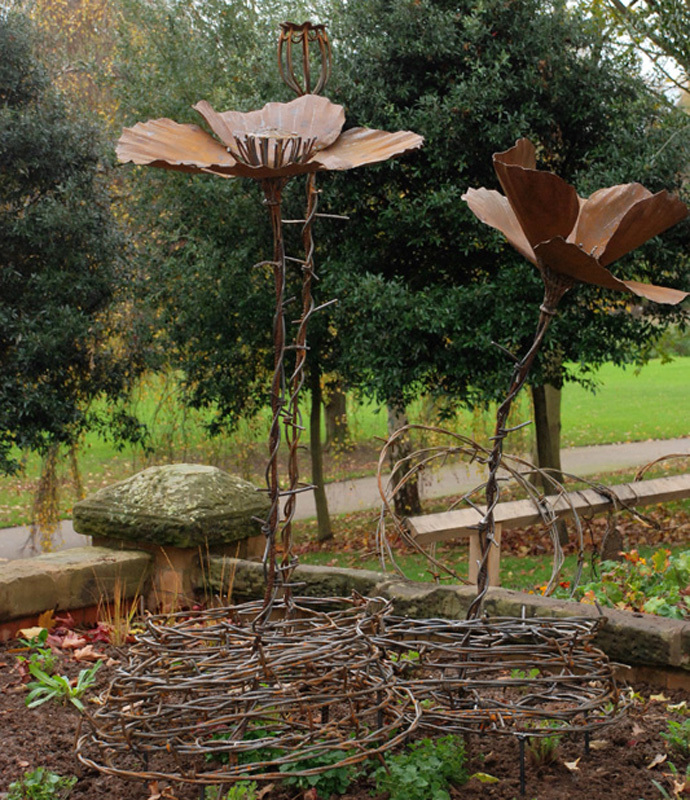 It depicted 3 oversized poppies growing up and out of coils of oversized barbed wire. The unfurling wire became the stems of the plants. This is now part of a memorial garden in a public park in Leamington Spa and the rust red tones nicely with the surrounding foliage, especially in autumn. The piece I have just completed is a departure for me, a ‘simple’ structure, an oversized knot, as if a giant had picked up a huge steel bar and twisted it before sticking it end up in the ground. The form, though simple in structure, was quite challenging technically. It is good to work on the edge of ones comfort zone from time to time. This too is for a garden setting next to a lake, and is also turning a wonderful rusty orange/ red. 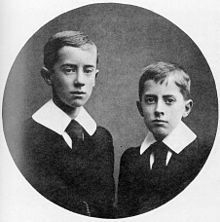 Tolkiendrim : Have you often worked on creations bound to the literary creation of your great-uncle ? 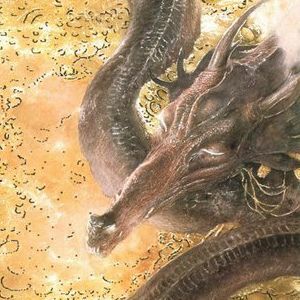 Tim Tolkien : The Tolkien legacy has been with me throughout my art career, and at times has been a double edged sword. Whilst he was still alive, my Great Uncle always took a keen interest in my painting and had offered to help fund me through art school but unfortunately he didn’t tell anyone official of this before he passed. Once out of art school and attempting to branch out on my own as soon as I tried to publicise myself and what I was doing iI was always introduced as ‘ Tim, great nephew of .‘But, just the mention of the name often opens doors in the first instance, so I can’t grumble ! These days I’m sometimes called upon to comment on ‘family matters’ or give my opinion on his writing and especially the films. 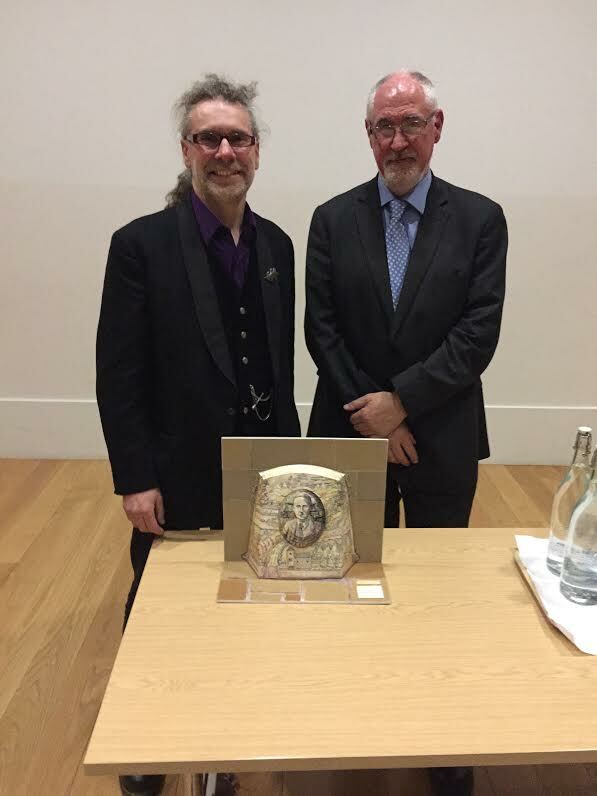 In these cases I feel I have little worthwhile I can add, but I have had the privilege to work on a few pieces in his honour within the Birmingham area where he and my Grandfather grew up, and now this piece for Oxford where he researched his subject, taught and wrote. Earlier in my career I would have distanced myself from such depictions, especially posessing less knowledge of his writings than most of the people who might view the artworks, but when I moved ‘back’ to the Midlands it seems more fitting somehow, to be able to honour my Great uncle in such a way. 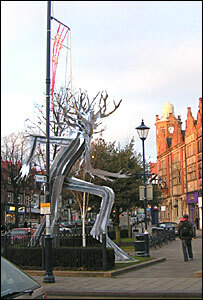 The first piece was the centre piece for a pub in Moseley. There are a few pubs in Moseley and Birmingham that are associated with Ronald but this was a new establishment seeking to belong. 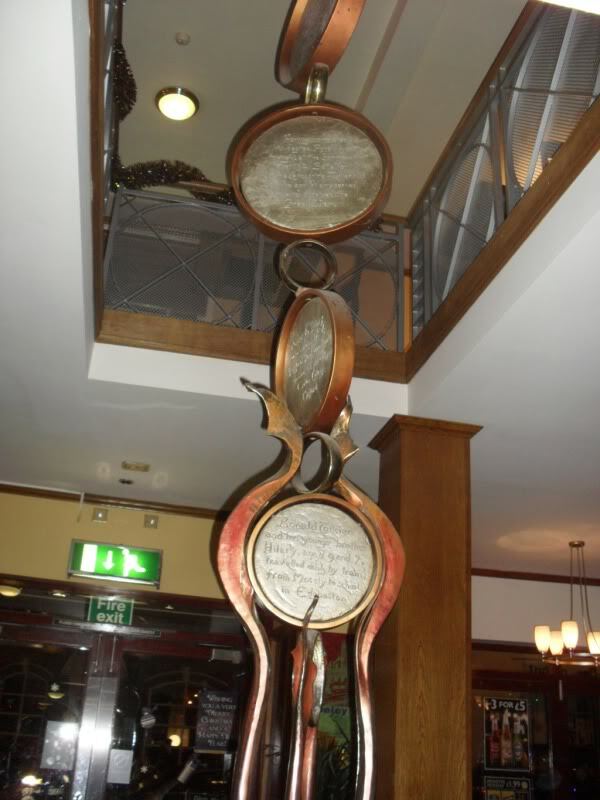 My piece stretched up from floor to ceiling through the heart of the building and incorporated fire, rings, bas-relief cast discs with images and information and culminating in a dragons head spitting flames hanging from the ceiling. Tolkiendrim : What about the Treebeard Sculpure that was planned in honour of J.R.R. Tolkien in Birmingham ? Have you encountered any difficulties in the creative process and do you have any anecdotes on this project to share with us ? Tim Tolkien : Many people think I have actually completed the Treebeard sculpture because they have « seen the photo in the paper »; Sadly this is NOT the case. The article in the Birmingham Post was a photomontage we had put together using the scale maquette set against the real view of Moseley Green. I was originally commissioned in 2005 and we tried for many years to raise the funds for the project but whilst we had some very keen supporters we still couldn’t manage what was required, so the project was put on hold. Strangely there has been a resurgence of interest over the last few months. A new site has been suggested in a local and rather magical ‘secret’ park, away from the roads and houses, where an Ent can walk freely amongst his fellow brethren. We still don’t have the funds but are looking into crowd sourcing: Perhaps there may be some interest from France ? If anyone wants to contribute by donating to the cause that would be fantastic. We are also looking into memoproducing a limited edition miniature Moseley Ent model and maybe making this available for sale to the world wide Tolkien community. Fans would know that by purchasing The scaled down Moseley Ent, then this would help us to produce a real life size iconic landmark in honour of my Great Uncle, set within a landscape that might have inspired him. Tolkiendrim : Let’s talk about the Pembroke College’s project, can you tell us how you’ve come to work on it ? Tim Tolkien : I was contacted by the college junior common room memorial committee, telling me about the commission and asking asking me if I would like to apply. The brief was. . Well Brief ! Pretty much a free reign on the design but the piece needed to be respectful to the historic nature of the surroundings which have a heritage listing. I was a little disappointed that I was being asked to tender in this way, which basically meant designing the whole piece speculatively. I prefer a commissioning process that selects a small number of candidates based upon the quality of previous work and reputation and then pays them to develop their ideas, before a final selection is made. This seems much fairer to me than expecting a larger number of artists to do a full design and costing on spec. Luckily my hunches paid off as my design was universally liked. Tolkiendrim : We saw the plans you drew, did the students who launched the project give you free hand, or were they more directive ? 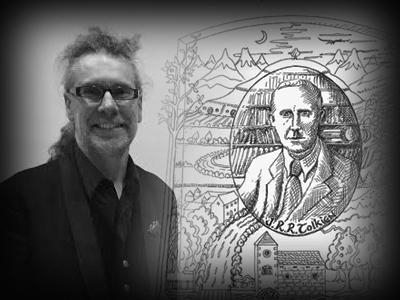 Tim Tolkien : The key to my design was to let J.R.R.Tolkien’s artwork tell it’s own story. We celebrate his literary skills but his own drawings and watercolour illustrations, his maps and his calligraphic style were all a part of his vision and what makes these tales so complete. Many artists have tried to give their own interpretations of Middle Earth, the Shire, the characters, but we are celebrating the world created by Tolkien himself, not that depicted by others. The other thing that has always struck me about my Great uncle’s artwork is that it is very much of the time in which it was written, his time. Design clues from the 20’s and 30’s abound in his illustrations fixing them firmly in the period between the wars, where as the stories themselves are timeless. 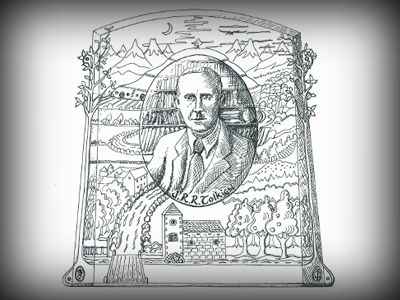 At the centre of my design is a portrait bust of J.R.R.T. In bas-relief. In the background can be seen his library and study where he wrote. This will be a traditional oval, the original modelled in plaster and clay before being sand cast in gun metal bronze. The surrounding frame will be in steel, but this will be hot metal sprayed in bronze, as I mentioned before. The horizontal lines iof the book shelves merge with the fields and hills of the Shire and the mountains of Middle Earth, in the same way his words Conjor up the imaginary world from the sanctity of his study. Tokiendrim : Have you started working on the concrete realisation of the memorial yet ? 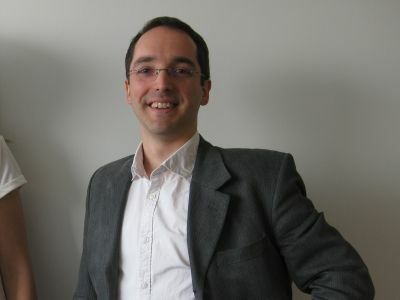 Tim Tolkien : I’m only at the very early stages of realising the actual piece (¹). I want to get the oval bust made first, as this dictated the frame; all the details radiate out from there. I visited the Bodliain Library in Oxford to look through their archives of photographs bequeathed by the family, to get as accurate a likeness as possible, ideally J.R.R. 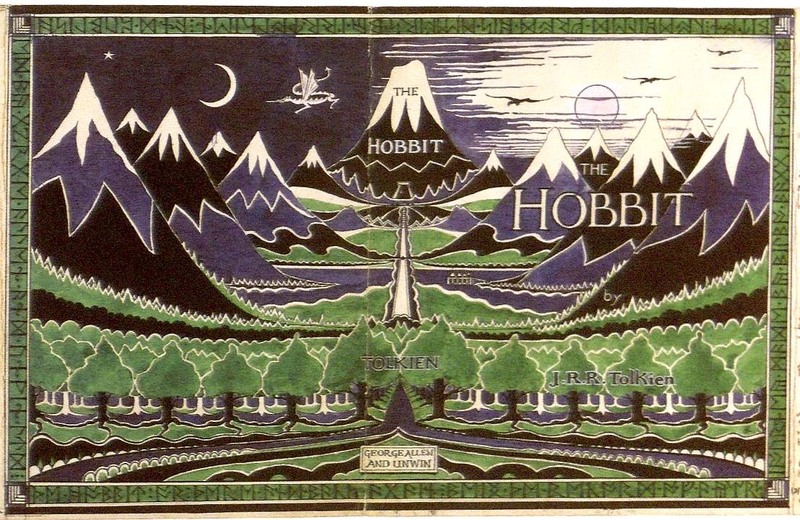 In thee mid to late 1930’s, around the time the Hobbit came out. Tolkiendrim : Can you tell us more on its final form ? Tim Tolkien : I intend the final piece to be very close to my original design, and the 3D mock up that I made this Spring; I believe you may have seen an image of this. 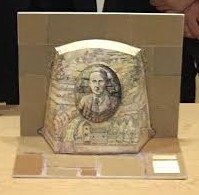 One of the key design clues was the need to complement the Samual Johnson (²) plaque on the wall diagonally opposite the intended location for the Tolkien memorial, which will be just below the windows to rooms that Tolkien occupied during his time at Pembroke. Tolkiendrim : Thanks a lot for answering our questions ! Tim Tolkien : You are most welcome, I trust it has been useful and thank you for this opportunity to tell this story from my side. (¹) As the interview was conducted in august 2015, the project may have progressed since then. (²) – Samuel Johnson (1709-1784) figures among the main writers of the british literature. 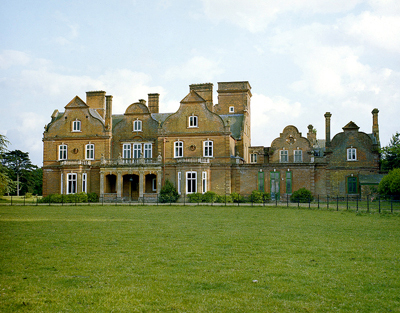 When he was 19, Johnson entered Pembroke College as fellow-commoner. Poet, essayist, moralist, biographer, editor and lexicographer, he was one of the most famous literary critic of England. 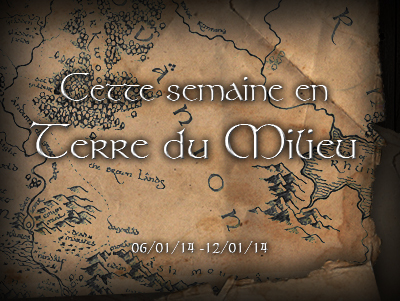 Exclusif ! Vincent Ferré répond à vos questions !